I've always loved fishing for flathead and I find there are some locations that have them consistently year round. My fav eating fish by far. Cheers mate thanks ! I have a range of rods Loomis, Shimano, Nitro, St Croix, Penn and Daiwa rods. They ALL have this and I rinse every time. I was thinking kids parents and grand parents would have Easter commitments. I noticed the other post about the jackets two trips in a couple of weeks and I haven’t lost any gear so that’s something. Exactly. The worst time of year to fish, equal with the days between Christmas and new year. At least you had a go and pulled up a nice feed of flatties. Awesome Stuff!! 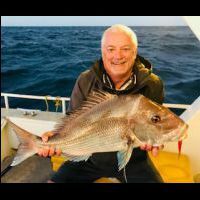 Great fish, thank you for the great report. The green toads swim fast enough to catch a lure, or a fast moving bait. This morning I had a chance to get out and was hopeful it would be quiet on the water with most people having family commitments. . What was I thinking. Anyway I struggled to get some Yakkas again so changed plan and targeted flatties. Boat back on the trailer and heading home by 11.00. Just a heads up guys I received an email from the DPI the Sydney North Fad is missing. Awesome fishing and a first class feed there. Well done. Well done Paid $55 a kilo for flathead fillets last week!!! What we use to call it was the flathead drift of shame, may need to be renamed!!!! Pencil me in too Geoff. If I can get the time off work, would love to be there. Any idea which month are you thinking of? On top, I have a couple of Christenings coming up (not sure when yet) and a wedding in August as well. Hopefully it's not at the same time.